I’m delighted to share this guest post by Brian Portnoy, author of The Investor’s Paradox. I think you’ll find the article below to be quite helpful if you’re interested in finding the perfect fund manager. You can read more about his book, The Investor’s Paradox , on Amazon. For the sake of full disclosure, I haven’t yet read this book. But from Brian’s article it looks like it would be a great fit with a large percentage of readers. So I’ll add it to my reading list. Now read what Brian has to say to decide if you want to do the same. Over the past couple decades, the market for investment funds has gone from a manageable corner store to a massive warehouse club with countless aisles and roof-scraping shelves. The quantity of choices is somewhat beyond comprehension. With tens of thousands of mutual funds, exchange traded funds (ETFs), hedge funds, and other products lining the shelves, making sense of the full opportunity set is nigh impossible. What’s more, the task is aggravated by the increasing complexity of the choices on offer: emerging categories like “liquid alternatives,” “smart beta,” and “active ETFs” require individuals, advisors, and institutional investors alike to bone up on the fund industry’s seemingly ceaseless factory output. Let’s face it. Very few of us directly build our investment portfolios by buying individual stocks and bonds directly. Perhaps we directly own a few blue chip stocks, or take a lark on exciting story stocks like Tesla or Netflix. Far more common is buying a menu of funds to reach our financial objectives. But what’s the right method for doing so? Let’s quickly tackle the standard method for identifying good fund managers: “The Five P’s.” One version of the time-honored list (from industry leader Morningstar) consists of people, process, parent, performance, and price. For alliterative pleasure and analytic robustness, we could also throw in portfolio and philosophy. These categories are all eminently reasonable items to consider. Who wouldn’t want to know about the people running the fund or what the fund costs? Ultimately, though, this approach is akin to driving while looking in the rear view mirror. A checklist of backwards looking attributes tells us some seemingly relevant facts and figures, but one would be hard pressed to find predictive power of future success in any of them. Indeed, in the practical world of fund selection, the Five P’s is a long-standing recipe for returns chasing. Performance tends to dominate our attention, and it is hard to resist the allure of good recent returns. Among other human biases, our built-in craving to see patterns (even where they don’t exist) and be overconfident about our ability to pick the “best” choices (with little evidence to suggest this happens persistently) put performance metrics too centrally in our crosshairs. In The Investor’s Paradox, I offer a different take. I believe that there are four straightforward questions that cut through the noise of fund investing. This is not a checklist of attributes, but guideposts to a establish a dynamic approach to making good investment decisions. The questions are pretty easy to get; putting them in motion — the dynamic part — is harder. We can pick a fund that has done well in the past, but if we just want to “set and forget” our picks, then we’re not adapting to change. Success here depends on a cycle of establishing and managing expectations. This is harder than building a checklist, but ultimately more useful. Can I trust you? No single investment can make your portfolio, but any single investment can break your portfolio. Just ask those who invested with Bernie Madoff. Trust is a complex affair, and in finance, it goes well beyond a forensic analysis executed by regulators and accountants. At a deeper level, it is a tricky psychological engagement to size up others as potential long-term partners with whom we share several key attributes, including transparency, fairness, and an alignment of incentives. A good pedigree and relevant experience are not sufficient. What risk(s) are you taking? Most investment funds focus on a particular asset class, such as bonds; and then a sub-category within that asset class, such as high yield bonds. It’s highly likely that the returns a manager delivers will be highly correlated to the returns of that class. The trick is figuring out exactly which sand box the manager is playing in, which grows more difficult with non-traditional offerings. Generally speaking, if a fund’s returns vary dramatically from its chosen sub-asset class, it means that the manager is much smarter than the other well-informed investors in that asset class (unlikely) or he is taking excessive, and in some cases inappropriate, risk in the portfolio. Are you good at what you do? In finance, there is a conventional notion of “alpha” that captures outperformance relative to well-defined benchmark. This is a useful, but narrow definition of skill. In the real world of selecting managers, skill transcends statistical analysis and becomes a social engagement involving expectations management. At its foundation, skill is about keeping one’s promises. It’s actually not easy for a fund manager to maintain consistent, predictable risk exposures, let alone demonstrate true skill. Finding ones that do will be a good addition to a well-designed portfolio. Are you a good fit? This question is an orange compared to the three previous apples, as we ask this of ourselves more so than the manager. Good investing starts by articulating one’s own objectives. Absent that first step, we’re effectively roaming around that middle section at Costco, randomly buying things that seem interesting or different. Lots of trustworthy, focused, and skillful managers aren’t good fits. Attempting to pick funds that consistently outperform others is futile. Just as there’s little evidence that even seasoned stock pickers can “beat the market,” there is no evidence that fund pickers can regularly pick winners. Even so, selecting the right fund managers for a particular purpose is quite possible. So while the four questions may sound basic, and each has nuances, they still allow us to first understand and then adapt with the experts we choose to manage our money. 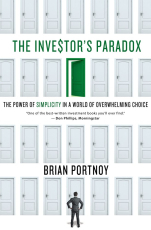 Brian Portnoy, Ph.D., CFA, author of The Investor’s Paradox: The Power of Simplicity in a World of Overwhelming Choice, has been successfully researching, advising, and investing in hedge funds and mutual funds for the past fourteen years. He is currently the Head of Alternative Investments and Strategic Initiatives for Chicago Equity Partners, a $10 billion asset manager. Previously, Brian held senior roles at Mesirow Advanced Strategies and Morningstar, the world’s premier research shop on mutual funds. He has spoken at numerous investing conferences across the U.S., Europe, and Asia, and has appeared frequently in major media outlets such as CNBC and the Wall Street Journal. Prior to his investing career, Brian pursued his research and teaching interests in political economy and markets at the University of Chicago, where he earned his Ph.D. in 2000. Brian is a CFA Charterholder and a member of the CFA Society of Chicago. For more information please visit http://www.theinvestorsparadox.com, and follow the author on Twitter. This blog was originally posted on Amazon’s Money Markets Blog. This entry was posted in Stock Ideas and tagged investment book reviews on March 21, 2014 by Jworthy.